Traditionally designed and tastefully decorated, the North Myrtle Beach condominiums at Beachmaster are appealing. They feature a well equipped kitchen with full-size appliances. In addition to a refrigerator and stove/oven, these kitchens boast a dishwasher to help you with the clean up during your North Myrtle Beach vacation. 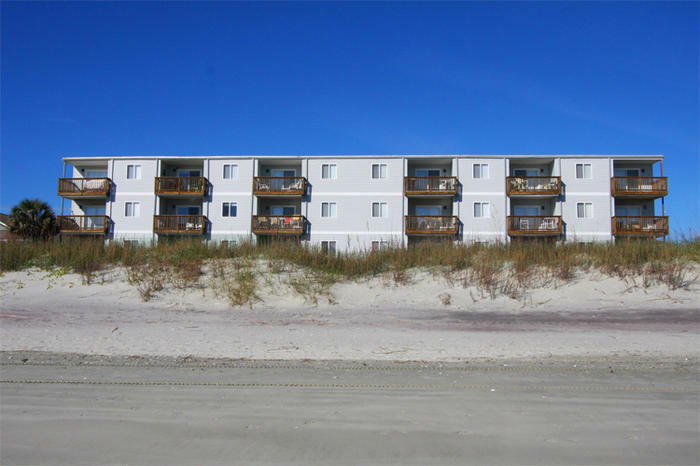 Take advantage of the microwave oven in these condos in North Myrtle Beach, South Carolina. Make popcorn and heat up leftovers when you want a snack during the day. Keep your favorite soft drinks and juices icy cold in the refrigerator so that all you have to do when you need something refreshing is run up from the white sandy beaches and grab something out of the refrigerator. Most of these condos in North Myrtle Beach, SC have more than one television and at least one DVD player. Many of these condos in North Myrtle Beach, SC have Internet access for your convenience. These non-smoking North Myrtle Beach rentals have a sleeper sofa in the living room that sleeps two people while each of the two bedrooms also accommodate two people. We want you to be comfortable inside Beachmaster, though it is what is outside that is the biggest draw for your North Myrtle Beach vacation. There are laundry facilities on each floor of this North Myrtle Beach resort so you never have far to walk to wash your family’s clothes. The balcony in each of these North Myrtle Beach condominiums is furnished so you can sit back and just enjoy the views of the Atlantic Ocean. Watch the oceanfront sunrise from the privacy and comfort of your North Myrtle Beach rental at Beachmaster. Listen to the roar of the crashing waves and watch pelicans take a nose dive for dinner into the fish-filled ocean waters. The views are panoramic and postcard-perfect and the ambiance could not be better than when you sit on your private ocean view balcony at Beachmaster. The balcony at these North Myrtle Beach condo rentals is accessed via the living room and the master suite. It is through these sliding glass doors that the sun just shines inside! This North Myrtle Beach resort has a grill area so you can run to the seafood market for the fresh catch of the day or to the grocery store for hot dogs and hamburgers and have your own little cookout at the beach. Enjoying a barbecue under the setting Myrtle Beach sun is a splendid way to dine during your North Myrtle Beach vacation. In close proximity to Beachmaster is a large selection of restaurants. Waterfront cafes, sandwich shops, seafood restaurants and fine dining establishments are right around the corner from this North Myrtle Beach resort. There are even dinner theatres nearby so you can watch a show while you eat a delicious four-course feast with the family. North Myrtle Beach amusements in the area include numerous water sports. From Sea Doo rentals and parasailing to deep-sea fishing charters and long fishing piers, the North Myrtle Beach, SC area is brimming with ways to enjoy the water. Cruise the Intracoastal Waterway aboard a boat and admire the local landscape on the riverfront. Live entertainment theatres in the area include the Palace Theatre, Carolina Opry, Alabama Theatre, Legends in Concert and Pirates Voyage. Singing, dancing, comedy and traveling Broadway shows grace the stages in Myrtle Beach and you won’t want to miss it! These theatres are found throughout the Myrtle Beach area and just minutes from Beachmaster. Shopping is another favorite activity in North Myrtle Beach, South Carolina. Broadway at the Beach, Barefoot Landing and Market Common feature shops, restaurants and entertainment all in one location. You can spend all day and long into the night at these Myrtle Beach area vacation destinations. Beachmaster masters the art of North Myrtle Beach vacations because of its location which is central to all the amusements and attractions you enjoy the most. So make reservations for this North Myrtle Beach resort and pack your bags. And with more than 100 golf courses nearby, don’t forget the golf clubs.